Isn't it cute?? 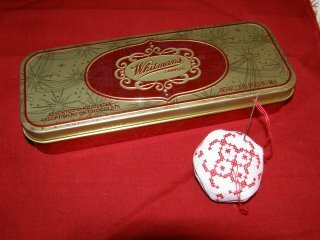 I got the first piece of the Vintage Red sewing set almost complete this morning. This biscornu is only a bit larger than a quarter which I guess shouldn't surprise me if you look at the tin it goes in but I was expecting it a bit larger still. Upon getting it all together I realized that I had forgotten to get a red button however to pull the center together. The LNS that I stitch at on Thursdays sells loose buttons so hopefully I'll be able to find something this evening and this piece will be complete. I have a good start going on the scissor sheath as well but that is a bit slower going. The whole thing is done over one thread. I stitched and stitched last night and it still seemed like I was getting no where, oh well. The motif is almost done and the initials go fast enough so I hopefully will have that one done today, I can't take it to Sit and Stitch this evening as mom will also be there and will be wondering where her copy of the pattern is so she can get started on this one and I've told her its still on backorder *grin* so I can actually try to surprise her for her birthday. Your biscournu is very pretty. Nice job. I just love it, you have done a wonderful job on it. Make sure and share a pic after you have the button on it! !